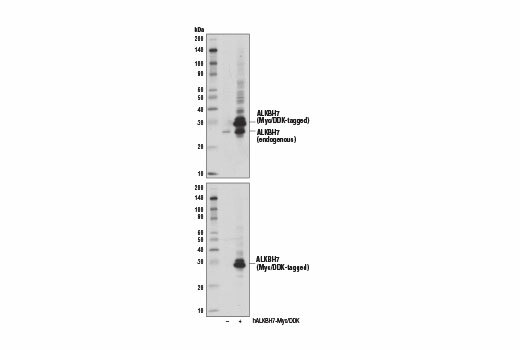 Western blot analysis of extracts from U266, K-562, and Raji cells using ALKBH7 Antibody. Western blot analysis of extracts from 293T cells, mock transfected (-) or transfected with a construct expressing full-length Myc/DDK-tagged human ALKBH7 protein (hALKBH7-Myc/DDK; +), using ALKBH7 Antibody (upper) and Myc-Tag (71D10) Rabbit mAb #2278 (lower). 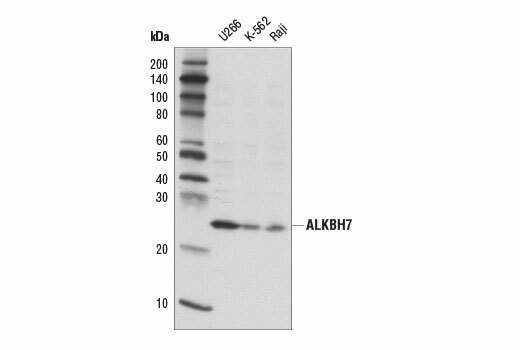 ALKBH7 Antibody recognizes endogenous levels of total ALKBH7 protein. Polyclonal antibodies are produced by immunizing animals with a synthetic peptide corresponding to residues surrounding Val34 of human ALKBH7 protein. Antibodies are purified by protein A and peptide affinity chromatography. The AlkB alkylation repair homolog 7 (ALKBH7, ABH7) is a member of the alkylated DNA repair homolog family that is responsible for repair of DNA damage induced by oxidation and alkylation (1). ALKBH7 is a nuclear encoded protein that contains an amino-terminal mitochondrial targeting sequence that directs import of ALKBH7 to the mitochondria (2). Unlike other Alkb family members, the ALKBH7 protein lacks a functional nucleotide recognition lid essential for nucleobase-binding, which abrogates any DNA or RNA repair capability (3). In response to DNA damage, mitochondrial ALKBH7 triggers the collapse of the mitochondrial membrane potential. The resultant loss of mitochondrial function leads to depletion of cellular energy and programmed cell death (2). Research studies indicate that ALKBH7 knockdown cells are resistant to apoptotic cell death induced by oxidizing and alkylating agents, which suggests that ALKBH7 may play a novel function in promoting cell death (2). Indeed, ALKBH7 has been identified as a key regulator of the alkylation or oxidizing DNA damaged induced necroptosis pathway (2). Mishina, Y. and He, C. (2006) J Inorg Biochem 100, 670-8. Fu, D. et al. (2013) Genes Dev 27, 1089-100. Wang, G. et al. (2014) J Biol Chem 289, 27924-36.